I've been using jqGrid for a quite a long time now. I've written some posts about it on this blog and answered a lot of questions on Stack Overflow. I've also created an open source project which provides strongly typed helper for easier use of jqGrid in ASP.NET MVC. So when I was approached by Packt Publishing with proposition of reading and reviewing the Instant jqGrid by Gabriel Manricks I simply couldn't say no. The Packt Publishing Instant series goal is to provide starter books for various technologies which take reader step by step from understanding what that technology is to being able to work with its most important features - Instant jqGrid follows this convention to the letter. If you are already familiar with jqGrid and know how to use its core functionalities you can stop reading right now - this book is not for you. The target audience for this book are people with no earlier jqGrid experience. Last section of the book contains directions for readers who would like to dive into more advanced aspects of jqGrid: official websites, articles, tutorial and places where you are most likely to get an answer when you are stuck. 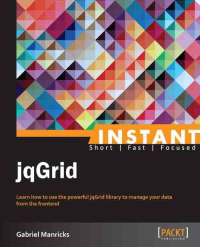 Instant jqGrid is first book about the jqGrid and it is very good that it is targeted at jqGrid newcomers as currently available learning materials are more like raw documentation for advanced users than beginners guide. The author did a great job, book is well written, logically structured and delivers on the promise of the series - going through it feels simply and natural. If you want to start your adventure with jqGrid this book will provide a well-organized how-to and when you will be ready to go beyond its scope you will know where to look.